GLO, CHICKEN REPUBLIC, STERLING BANK, HITV, M-NET FOR FELA! Broad chested corporate bodies like Lagos State, Hi-TV, M-NET, Chicken Republic, Skye Bank, GDN, Sterling Bank, M-net, among other top brands have thrown in huge supports for FELA! an original Broadway musical produced by Shawn ‘JayZ’ Carter and Will Smith and directed by Bill T. Jones, FELA! is set to be performed at the New Expo Center of the Eko Hotels and suites, Lagos, Nigeria from the 20th to the 25th of April, 2011. Telling the true story of the legendary Nigerian musician whose soulful Afrobeat rhythms and cutting lyrics ignited the spirit of empowerment and cultural awareness in a generation, the cast of the Fela musical are overjoyed and excited at this opportunity to bring FELA! to Nigeria. 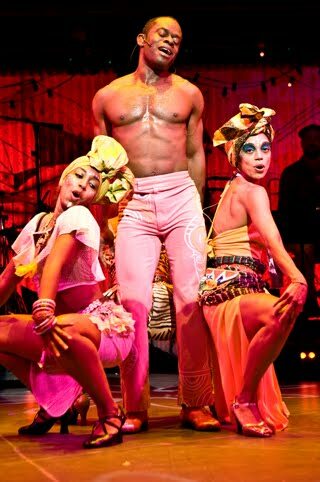 Described by the Times Out New York as more than a musical and an ecstatic phenomenon, FELA! opened and triumphed at London’s Royal National Theater for a three-month sold-out run. That production was nominated for three Olivier Awards, London theatre’s highest honor, including Best Musical, Best Actor (Sahr Ngaujah) and Best Choreography (Bill T. Jones). A production of this standard brought to Nigeria by Broken Shackles Limited is sure to affect the theatre culture in Nigeria positively by broadening the scope of theater practioners in the generality. The success of FELA! internationally prompted the need to bring the Broadway show to the birth place of the Afrobeat Legend- Fela Anikulapo Kuti on which the Broadway musical is based. According to The Broadway League, Broadway shows sold approximately $1.037 billion worth of tickets in calendar year 2010, compared to $1.004 billion for 2009, but it is being highly speculated that because FELA! Is Nigerian, its number of viewers is set to beat the international Broadway records. A proof of this is the heavy traffic at FELA! ticket centers in Lagos.